In cooler climates or homes with no garden space, it is often preferable to plant fruit trees in pots. 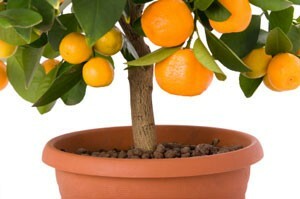 This is a guide about growing fruit trees in pots. My husband and I are living in our first house where we expect to stay for another 2-3 years before moving to a house further out of the city with a bigger garden. We'd like to invest in some fruit trees which can be grown in large pots now (possibly trained against a fence) and then planted out to grow into bigger trees once we buy the "Forever House". Is this a realistic proposition? Do folks have good ideas about fruit trees which might work like this and particular types? Although our hardiness zone is 9b, UK summer temperatures are nowhere as high as those US States with 9b ratings. We might just get away with hardy figs or apricots, but peaches for instance aren't an option. Think northern Florida in winter, but Chicago in summer. Grateful for any help you can suggest! 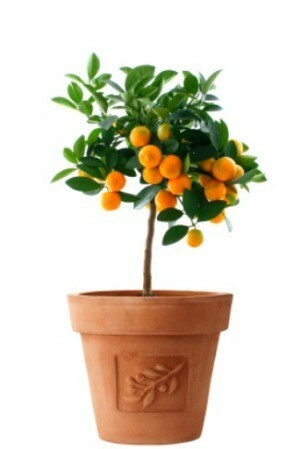 Citrus fruits grow well in pots, lemons, oranges, mandarins, etc. A neighbour of mine has a fig tree in a very large pot, but it may not be warm enough where you are for figs. Pears and apples another thought. Make sure it is not a variety that needs free roaming root systems. Some will strangle themselves off, like an over stuffed potted house plant. Again, tell the nursery you get them from what your idea is to move them when established. There may be limited trees that tolerate that. They also may have a dormant time frame if they are moved. I would like advice on growing dwarf fruit trees in a pot. There are lots of good tips right here at ThriftyFun. Many people enjoy growing fruit on their patios or deck by using large pots. This guide has information about how to grow fruit in pots. I recently purchased ultra dwarf fruit trees stating they will only grow 5 to 6 feet. I want to put them in 15 gallon pots. What is a good commercial potting mix? I would appreciate some specific feeding and watering schedules. Almost any commercial potting soil should work just fine for growing dwarf fruit trees. Also, if you want to mix your own, just use a 1:1:1: ratio of sand, peat and vermiculite or perlite. You want the soil to be loose enough for adequate drainage, without being so loose that water runs right through the pot every time you water. Refresh the soil by replacing the top 2 inches of soil with fresh compost each spring. As far as feeding, any plants confined to a container will need to be fed more frequently than those grown in the ground. 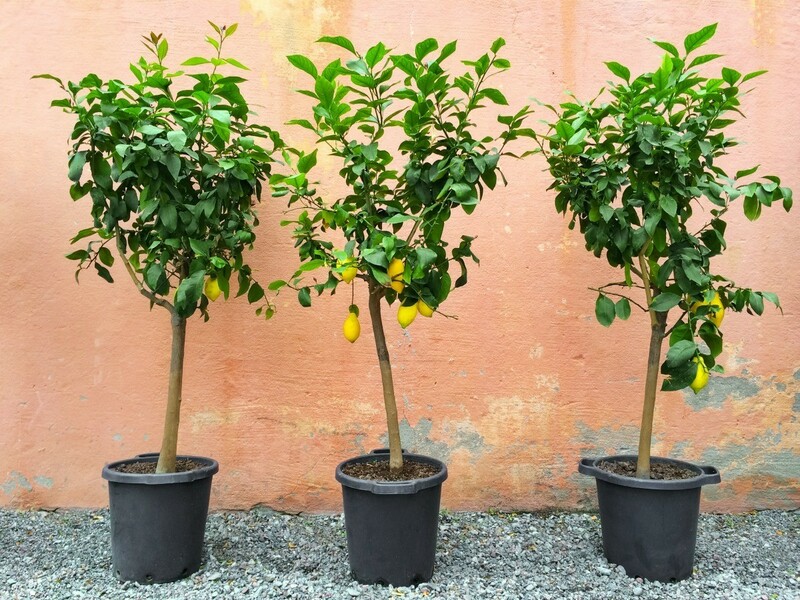 Look for a fertilizer especially formulated for citrus trees or fruit trees to use from spring through mid summer. Start by feeding once every two weeks and adjust the frequently according to how the plant is responding. I always recommend using a liquid or water-soluble fertilizer at half strength to start with for plants in containers. Most people tend to overdo it, and in the case of fruit trees, too much fertilizer will give you lots of plant growth, but be detrimental to fruit production. When watering, keep compost moist (not wet) during the active growing season. Do not allow the roots to stand in water. Check water daily to prevent the soil from drying out, and remember that the plants will require less water in the winter. Poke your fingers down through the top two inches of soil. It should always feel on the dry side of moist. Over time, the overuse of fertilizers (or water containing soluble salts) may result in excess salt building up in the soil. A white crust on the soil or inside of the container is your indicator. Use a liquid or water-soluble fertilizer according to package directions and when in doubt, go light. To flush out excess salts, pour water slowly over the soil for several minutes until the water drains freely out of the bottom of the pot.